Meguiar's Ultra Finishing Polish 205 is the perfect follow up to a more aggressive polish, like Meguiar's Ultra Cut Compound 105, or for paint with minor imperfections. 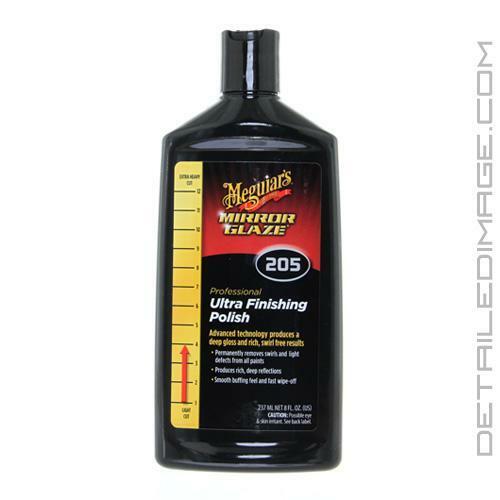 Meguiar's Ultra Finishing Polish 205 is a light polish designed to finish down very smooth removing haze and hologram while enhancing the gloss and depth of any paint color. This is another premium polish from the Meguiar's Professional line of Mirror Glaze products that helps you get better results faster. Detailers typically use the M205 with an orbital or rotary buffer with a white polishing or black finishing pad. 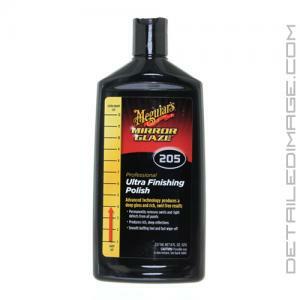 See why so many professional detailers have Meguiar's M205 in their polish arsenal. M205 quickly restores a high level of gloss after compounding with M105; so long working times are not required. You will be amazed at how little effort is required with M205. It provides incredible results with minimal time. M205 permanently removes swirls and light defects from all paints, and can be applied by hand, by a random orbital polisher, like the PC 7424XP, or by rotary, such as the Makita 9227C. The M105/M205 combination from Meguiar's is capable of heavy paint correction while finishing with a high level of depth and gloss, and it does it in less time than traditional polishes. It does require a different technique than you may be used to, and it may take you a few times to get the system down to make it most effective. Once you've accomplished this however, you will be very pleased that you gave it a try! DIRECTIONS: SHAKE WELL. Always work on a cool, properly cured paint surface. Rotary application: Work one section at a time. Set rotary buffer to approximately 1000-1500 RPM's. Use with Meguiar's Soft Buff 2.0 Foam Pads. To prime new or dry pads, mist on M34 Final Inspection. Apply M205 Ultra Finishing Polish directly to the paint surface and begin working in a 2'x2' area with overlapping passes. Continue working until light film remains. Wipe remaining residue with a Meguiar's M9910 Ultimate Wipe Microfiber Cloth. For extreme gloss, apply with Meguiar's G110 Dual Action Polisher with a W9207 Soft Buff 2.0 Finishing Pad. DA application: Apply directly to appropriate Soft Buff 2.0 Foam Pad. Set machine to 4-5. Apply moderate pressure on initial 2-3 passes followed with light pressure for following two passes. Wipe off residue immediately after each panel. Pair up with a orange Lake country light cutting pad or white polishing pad, gets great results. Love this stuff! Great finishing polish. Works best after using a stronger cutting polish (m105) or on scratch free paint. It's more of a gloss enhancer than a scratch remover. Good stuff...took urethane 2K out to nice finish from 2500 wet sand.